Exactly like the Mastiff, but without the drool? I only came up with the ad for the book. I think that in them stating everything you ever need to know about the breed is contained in 200+ pages speaks to the depth of the breed. Have they finally produced an actual written copy of their COE? Health Certs to back up their claim of less health problems than the Mastiff? Can they prove beyond a reasonable doubt that the Anatolian temperament does not override the Mastiff temperament? Did they finally narrow down exactly what two breeds made up this mutt (remember Frederika herself wasn't sure when she emailed someone on this)? Are they still claiming it's an EM crossed with an Anatolian Mastiff? Have they admitted finally that the dogs they produce end up in rescue all the time?!?!?!? I have been blocked from all of their pages so all I have been able to do was call and ousted breeder from their council, who did not return my calls. I wonder how long before there are books on Cavoodles, Beagaliers, Schnoodles, Mugs and Jugs etc. Same thing, just another designer dog. They are not a breed of dog, they are a crossbred animal and stuff like this makes clueless buyers think it is a recognised breed. Wow, 2 beautiful pups pictured there aren't they!!!!! Why can't everyone just stop hating on these dogs. How many of you have ever had the privilege of meeting one of these amazing animals in person? I joined this forum because I am a dog lover and I love all types of giant breed dogs and I love to read about and see pictures of everyone's fur babies. I will probably get asked to leave this forum now, but I can't sit back and not say anything any longer. Yes, I am the proud owner of not one, but two of these hideous beasts that everyone dislikes so much. I love dogs of all kinds and I would never pick on one certain breed just because I didn't like the name it was given so many years ago. I do not try to pass my babies off as English Mastiffs nor do I tell people that they are "just like English Mastiffs" because they are not. I have had the pleasure of meeting a few English Mastiffs and they are magnificent animals, but I just happened to meet and fall in love with the AM and the rest, shall we say, is history. That being said, I would also love to adopt quite a few of the English Mastiffs that I see on here and on facebook that are looking for new homes, but my hubby seems to think that 2 is enough and I can't figure out how to change his mind!!! I am so proud of my "kids" and we get nothing but compliments when we have them out in public. They are both the best natured, most loving dogs I have ever owned and my house will never be without an AM again. They want nothing more than to be with us and they love to meet new people wherever we go. So before you criticize them, please realize that we all love our dogs as much as the next person. OK, like I said, I will probably be asked to leave this forum now, so thanks for letting me be part of it for the time that I was. I really did enjoy all of your dog pictures and the stories that went with them. I would be astonished, and equally disappointed if you were asked to leave the forum for expressing your love for your dogs. I think it is MOST unfortunate that the AM powers-that-be decided their marketing campaign should include a comparator with the Mastiff (aka English Mastiff), including ( paraphrasing), 'like a Mastiff but without the drool', and the claims (thus far undocumented) of superior health. I also think that Mastiff organisations had ample opportunity to adopt the appellation, "American Mastiff" but chose not to, leaving it 'open for grabs'. My most important view is that -- whatever one thinks of the AM organisation and people/PR involved -- the dogs, themselves are blameless. I agree with Lisa, if you were simply looking at pictures of dogs, would you not find the ones Steve posted as attractive? Why ridicule them? The trapezoidal head shape is not a Mastiff ideal, nor can it be compared to one. The Anatolian, does have that kind of configuration and the AMMA expresses it in the picture that was used in the first post. The dogs cannot help their own creation and should not be blamed, nor have they been. Most people who argue against the breed, are discussing false statements & beliefs made by those who are simply clueless! Erroneous remarks made to elevate this cross on the back of the true Mastiff, is what has provoked the angst in Mastiff fanciers. I have nothing against Lisa, nor would she be removed from this forum for expressing what she has to date. "....nor have they been". I disagree. If one is mocking pictures of dogs, then one is casting aspersions on them. If people want to go after Fredricka and other breeders, have at it. But please have some compassion for the dogs, and the people who have fallen in love with individuals pups. I have had a couple of English breeders I've developed an acquaintanceship with complain that our mastiffs are (in the strongest statement)a 'bastardised' version of the English Mastiff -- primarily, as I understand it because of the differences in 'wrinkle' in the respective standards. The Guy: "Is that an American?" The Guy: "What kind of dog is that?" The Guy: "An American Mastiff?" Me: "What's that? She is a Mastiff"
The Guy: "What kind of Mastiff, I have an American?" If one is mocking pictures of dogs, then one is casting aspersions on them. Not mocking! I'm showing the difference in type, which original AMMA literature states as being identical to the Mastiff. The aspersion is against the erroneous & misleading written copy, not the cross. I might add, that the original aspersion was thrust against the Mastiff proper from the AMMA community. Yes, I am fully aware of this, Steve. I don't disagree with this. However, in my mind the key question is which strategy/tactics have the highest likelihood of creating this awareness -- or even the motivation to investigate a breed/individual more thoroughly. I really don't believe the answer lies in continuing and escalating conflict. Without continued controversy, issues become obscure and the dissonance dissipates. Attempts at awareness can only be continued, if the issues are kept fresh for those contemplating a purchase. produce fakes and market them as originals, or try to convince buyers that it's OK to fool the public, are justifiably subjected to criticism. When reason fails and those who commit wrongs simply don't give a damn, conflict inevitably ensues. To date, we have not heard one statement, or retraction from the AMMA camps correcting their falsehoods & damages done to the Mastiff community. Yet, the genuine Mastiff fancieir is being made to be seen as the culprit, in an attempt to deescalate conflict! Perhaps Americans also caused the destruction of the WTC, at least it's the storyline used by those who destroy American property & American lives. I have seldom, if ever, been as shocked as I am with this statement!!! I had to go off and attend to several other matters before I could begin to contemplate a reasoned response. The situation, as I view it vis-a-vis the Mastiff organisation and the AMMA organisation, can be framed as a PR issue. In my experience, important steps in resolving serious PR issues, include: 1) to analyse and acknowledge mis-steps or mistakes 'your side' has made. As a relative new-comer to Mastiffs, I believe that the Mastiff founders in this country by whatever rationale, chose neither to continue the 'English Mastiff', nor to adopt 'American Mastiff' nomenclature, as many other breeds have elected to do. This left the 'American Mastiff' designation open, and someone seized it. Case closed, blood under the bridge. 2). Look for actionable claims and statements being publicly disseminated -- AND step up and take action. For example, I think the claims that the AMMA is just like a Mastiff but has a dry mouth (paraphrasing) IS actionable! 3). Find (positive) stratagems for building support in the larger -- in this case canine -- community. In your statements Steve, we have progressed from a (what I would construe as unnecessarily sarcastic) comment about pictures of dogs to equating dogs to handbags and jewelry,onto the world stage and AMMA as terrorists destroying American (Mastiff organisation? ) property and lives ? Or, in your analogy, am I the terrorist blaming America, it wasn't clear? If I have misunderstood, please clarify. I think this depicts a depth of emotionalism that makes it very difficult to pursue a rational discussion. I don't believe it's irrational to state valid offenses in this venue. done to the Mastiff community by false & misleading statements directly targeting the Mastiff proper by the opposition. I don't believe it's irrational to compare counterfeit goods to counterfeit breeds, riding on the brand of the genuine product. I don't believe it's irrational to defend the Mastiff community, when they are being made to appear as the one's creating, or escalating the conflict. I don't believe it's irrational to address the issues on this forum, when one is kicked off & barred from AMMA forums in order to discuss the points involved. I don't believe it's irrational to compare & illustrate differences in breed type, when they state there are few if any differences. I don't believe it's irrational to voice opposition to time honored names usurped by others, when legal actions are unobtainable in protecting traditional brands in dogs, due to loopholes in the law. I don't believe it's irrational when most Mastiff breeders & the MCOA have posted opposition to the AMMA in forums & club websites. I don't believe Ford would agree that an English Ford, or American Ford brand would be acceptable, if used by another car company, without Ford's permission. Why is it OK for an American Mastiff brand to be acceptable, without first getting our permission? If I appear passionate, it doesn't mean I'm irrational about the subject. I just don't appreciate the dung used to fertilize the field and then being told to just ignore the fragrance! There was never an English Mastiff, nor an American Mastiff! A Mastiff in America can be considered an American Mastiff. Just as a Mastiff in England can be considered an English Mastiff, etc. To capitalize on the coattails of our brand, even if unactionable, is still immoral. The original American Mastiff Club was not referring to the present cross, it was referring to the Mastiff proper in America. Although the club no longer is operating as the American Mastiff Club, there is still a time honored precedent that is well documented, and as such, should have been respected by those who first do their due diligence, before naming their designer upstart cross. I laugh at AMMA fanciers who get upset by the Panja, which also calls itself the American Mastiff! The pot calling the kettle black!!! At least this designer breed took it's own form and is closer in looks to the Rottie than the Mastiff . Nor have they claimed to be just like the Mastiff and they have added Panja to the name. Had they called this breed the American Rottweiler, I believe they would also be taking some heat, and justifiably so, if that were the case! What I said was " I think this depicts a depth of emotionalism that makes it very difficult to pursue a rational discussion" -- which you have just proved true. I dare say you are acting irrationally at the moment, which does surprise me, but I am not going to be bullied out of this discussion by emotionalism. As I said, the 'Mastiff organisation' had an opportunity to adopt the 'American Mastiff' appellation -- and copy-write or trademark it, yet it did not. Why did the MCOA not officially adopt the name "American Mastiff Club"? Time honoured precedent is not a legally binding concept. If you want to argue that it is, then some entity should have taken legal action long before this. Well, for one, Ford Trademarked its brand. The Mastiff organisation in the US did not. I think it is quite irrational, and totally inappropriate to liken the Mastiff organisation dispute with the AMMA organisation to the terrorist acts against the WTC which caused devastation, pain and suffering and horrendous loss of life. I have outlined actions that could be taken which have proved effective in major PR conflicts, which you have not chosen to address at all. What I said was " I think this depicts a depth of emotionalism that makes it very difficult to pursue a rational discussion" -- which you have just proved true. You certainly have a right to your opinion, even if it's incorrect! I dare say you are acting irrationally at the moment, which does surprise me, but I am not going to be bullied out of this discussion by emotionalism. As I said, the 'Mastiff organisation' had an opportunity to adopt the 'American Mastiff' appellation -- and copy-write or trademark it, yet it did not. There was no need to do it, since there was no reason to do it for over 100 years. After the fact, I was told by legal counsel, that it would be very hard to litigate such an action. It's why I irrationally stated it was perhaps legal, but immoral! Whether you like it or not, in England, the mastiff is officially referred to as the Old English Mastiff (with various spellings of Old/Olde). In America, a number of breeds have adopted the "American' appellation to distinguish it from its English fore-bearers. It was not automatically assumed. Why did the MCOA not officially adopt the name "American Mastiff Club"? Time honoured precedent is not a legally binding concept. If you want to argue that it is, then some entity should have taken legal action long before this. Never said it was illegal, so I repeat once again, it was in bad faith and morally reprehensible. Well, for one, Ford Trademarked its brand. The Mastiff organisation in the US did not. Perhaps short sighted, but it doesn't mean it's therefore OK to usurp the brand. Once again, legal vs moral! I think it is quite irrational, and totally inappropriate to liken the Mastiff organisation dispute with the AMMA organisation to the terrorist acts against the WTC which caused devastation, pain and suffering and horrendous loss of life. I didn't liken it to the terrorist acts, that would be irrational! I likened it to the reasons the Muslim world gave in justifying those acts! It's not our fault that the AMMA people are blaming us for this conflict. They got that ball rolling, not us! It's caused damage to Mastiff breeders and the Mastiff breed. Now, just as in the aftermath of the WTC, we are being blamed for the escalation of hostilities. To me, THAT'S irrational, but what do I know! I dare say you are acting irrationally at the moment, which does surprise me... but I am not going to be bullied out of this discussion by emotionalism. As I said, the 'Mastiff organisation' had an opportunity to adopt the 'American Mastiff' appellation -- and copy-write or trademark it, yet it did not. There was no need to do it, since there was no reason to do it for over 100 years. Unfortunately that short-sightedness left the name "American Mastiff' unprotected. Whilst I'm on the topic, I do apologise for comments about the English Mastiff Standard. I was quite incorrect, although I believe the original standard was drawn up in 1883, revised in 2009. One observation I would make is that the organisation which has drawn up and holds the standard is currently titled, and has been since 1883, The Old English Mastiff Club -- an appellation which has been trade-marked. After the fact, I was told by legal counsel, that it would be very hard to litigate such an action. Litigate which action? Challenging the name, or challenging the descriptor likening the AMMA to the mastiff? It's why I irrationally stated it was perhaps legal, but immoral! I think it is quite irrational, and totally inappropriate to liken the Mastiff organisation dispute with the AMMA organisation to the terrorist acts against the WTC which caused devastation, pain and suffering and horrendous loss of life. I didn't liken it to the terrorist acts, that would be irrational! I likened it to the reasons the Muslim world gave in justifying those acts! It's not our fault that the AMMA people are blaming us for this conflict. They got that ball rolling, not us! It's caused damage to Mastiff breeders and the Mastiff breed. Now, just as in the aftermath of the WTC, we are being blamed for the escalation of hostilities. To me, THAT'S irrational, but what do I know! That is still making the parallel that the Muslim justifications for destroying the WTC and killing 2,000 + people is on the same plane as the AMMA damaging and blaming the Mastiff community. For me, it is very telling that that is the model/analogy that came to mind for you in this case, and that you decided was appropriate to best illustrate your point/feelings. I have outlined actions that could be taken which have proved effective in major PR conflicts, which you have not chosen to address at all. It's been addressed years ago in this forum, but there was little that could be done after the fact....Reasoning & stating our case fell on deaf ears. Legally it was a cul de sac... What, exactly was addressed/attempted? (if you have archived thread titles you can refer me to, I would be interested in reading them). When you say "there was little that could be done after the fact" and "Reasoning & stating our case fell on deaf ears", it sounds as if the focus was still the perceived usurpation of the American Mastiff nomenclature. and those who tried to speak on the issues in AMMA forums were banned. So your suggestions are unrealistic. I made no suggestion about speaking on the AMMA forums. Why in the world would you do that? I made no suggestions about attempting -- after the fact -- to take legal action to reclaim the name. That is clearly blood under the bridge. I agree that expecting desired outcomes from either of those approaches was/is unrealistic. I don't disagree with this. However, in my mind the key question is which strategy/tactics have the highest likelihood of creating this awareness -- or even the motivation to investigate a breed/individual more thoroughly. The audience is the mastiff fancier and the potential buyers of large breeds within the public, NOT the AMMA organisation which obviously has a deep financial and emotional investment in their dog. As I said, I really don't believe the answer lies in continuing and escalating conflict. Expanding on this, my observation is that the two organisations are caught in a conflict escalation spiral, in which each feels as though an injustice has been/is being committed by the other. Both see themselves as having been wronged, and unfairly blamed for the conflict, by the other party. . With each escalation, the rhetoric and the 'hitting back' become increasingly strident and emotional, and each of the adversaries increasingly views the other as a collective stereotype rather than diverse individuals, and as moral villains (my word). This conception 'justifies' more egregious attacks in the conflict. There are a couple of problems with supporting this spiral. The first is that individuals, entities and reputations are damaged -- and the damages increase as the spiral escalates. The second is that 'bystanders' -- which include forum members and readers and the dog buying public -- become drawn into the polarising fray and take sides -- often siding with the party who is able to present themselves most sympathetically. To the extent that the conflict moves into the public awareness, the organisations will be increasingly damaged. Yes, I have read this, and I think this kind of PR initiative is very sensible. Have similar approaches been made to Wikipedia and other organisations which appear in searches for "Mastiff"? Truthfully Erika, because personally, I am not deeply and emotionally invested in this conflict. Even if I were, I have other life priorities at the moment. Additionally, I don't think our Mastiffs require 'protection'. They stand and (figuratively) speak for themselves. I believe our Mastiffs are beautiful and highly distinctive in appearance, as well as being a breed of ancient, and noble origins -- or at least antecedents -- which has been disseminated world-wide. They are recognised by the (UK) Kennel Club, the AKC, the UKC and many other country specific and reputable registering organisations, which sponsor shows and various kinds of competitions. Hence our Mastiffs are visible and in the public eye. There are tens of thousands, if not hundreds of thousands of breeders world-wide. I don't perceive 'American Mastiffs' posing any kind of threat or challenge to our breed. As we know, AMMA' have been around for only about 25 yrs. The last I looked there were eleven approved breeders, including one ostensibly in China and one in the Philippines -- hardly a massive incursion. In February of this year, AMMA members voted not to pursue AKC recognition. I belong to their board, and the people I've encountered there are warm, polite and love their dogs. Many express bewilderment about this conflict. Their board rules do not allow 'breed bashing' of any kind, which is enforced. The pictures I've seen have been of dogs who (like all dogs) express different degrees of attractiveness, but to my eye do not resemble the Mastiff, and are not likely to be mistaken for one. I have offered observations and suggestions because there obviously ARE a number of people here who DO have a huge investment; and in my experience, escalating conflict spirals generally end poorly for all involved. As an after-thought, I think that with our dogs (and a bit diplomacy) we can all be ambassadors, on small scale, for our breed. I know that over the past year, at least four people have been motivated to obtain well bred Mastiffs from reputable breeders after meeting Boris and contrasting him with their various 'mastiffs'. I see the British club name as. The Old English Club, for Mastiff fanciers !!!! The Old English Snooker Club, would not mean, it was old English Snooker !! It would mean, it was an old English club, for snooker players !! The Old English did not pertain to the dog, it was to contrast the club from another club that existed simultaneously. The dog was called.... Mastiff. The club designate was Old English. For me, it is very telling that that is the model/analogy that came to mind for you in this case, and that you decided was appropriate to best illustrate your point/feelings. Since I don't invest my emotions, or make value judgments in comparatives, the analogy stands. If you are affected by the comparative, then you must search within yourself to explore why it is more highly charged for you. If the AMMA people blame us for starting things (which is of course well documented, as to just the opposite) then why is the comparative any different for some in the Muslim world, who blame us for the WTC loss? Both are irrational perceptions, used by others, to justify wrongs committed by themselves. Since I don't invest my emotions, or make value judgments in comparatives, the analogy stands. ...and my observation still stands. My perception is that there are a host of comparators and analogies available to you which could far more aptly have expressed a parallel. I believe you consciously or subconsciously chose the analogy that best expressed the depth of your emotional response to actions of the AMMA. This was supported by the highly emotive statements in # 15. If you are affected by the comparative, then you must search within yourself to explore why it is more highly charged for you. And I would ask you what you find so terrible about the adoption of the (unclaimed and unprotected) nomenclature 'American Mastiff' by the AMMA people, that you allude to terrorist acts and justifications --as you, Grant and others are insistent that our breed is simply the Mastiff? First, that is not what it says, that is your interpretation -- which is fine. Grant, that did not answer my question. 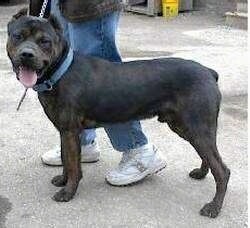 To be honest, if I thought I was NOT buying an 'English Mastiff", I may well have gone for a Neapolitan or Cane Corso. However, I did, and I am now committed to the breed, whatever it is called. I have not said I do not sympathise/empathise with Steve's feelings. What I have said, is I do think equating this situation with THE terrorist act against our country thus far in this decade, is overkill. I do understand how the actions of the AMMA grated -- but again with the continued insistence that the Mastiff is 'The Mastiff', it weakens the argument imo. But other than that, i would not interfere in an argument, that so far is about an obvious cross, that i cannot see, ever being accepted by the AKC !! Exactly. And as I said, they have voted not to strive for AKC acceptance. ...without people like Steve, that are so passionate about our breed, there would be no need to worry about the name, as our breed would no longer exist !!!! That may well be true, and I have tremendous respect for Steve's contributions. Can you provide a copy of the Breeders Council COE? A list of required health tests along with any consequences the approved breeders faced of they do not comply with the health testing? These are simple things I have asked for from that camp on multiple occasions and have yet to receive. I belong to the forum, I do not belong to the Breeders Council. I am on nobody's 'side'. So what is your point? You said you were on the Board. My point is this: These people make all kinds of claims about these mixes being healthier, having less drool, never needing rescue, but they will not provide proof to back up these claims. Sigh...by the 'board' I meant the forums. If you have read the thread rather than fastening on something you disagree with, you will see that I have encouraged moving on claims that may be legally actionable. One thing that I would comment on: Part of the escalation spiral of conflict includes marginalising or vilifying members of a community who have a moderate perspective towards the 'adversary'. I have been blocked from all pages and sites, I called and emailed and ousted breeder from their camp and got no response. I am trying like hell to get proof of these claims from the breeders and their council, that is all it would take to shut me up, but they never respond except to ban me. What exactly is it they want to hide so badly?!?!!? The MCOA COE is up all over the internet for people to see, links to health testing are all over the place as well. They can come on this website, say whatever they want (including Michelles nice little bit about how I should never have children seeing as I am such a horrible person) yet any of us cannot go on their forums and sites seeking answers to valid questions! Without people who are actually in the trenches so to speak showing and breeding these dogs the breed would cease to exist. They all add together, as a band of like minded people, to help improve the breed they love, to the best of their abilities !!!! Well, I'm not sure they are completely like-minded, but I agree about the like motivation. Karen, so what if Steve overkilled his comparison, surely that is upto the writer to decide !!! Mastiff, is the name of our breed, like it or not !! It may weaken the argument, but we can't change the name to help that situation !! Grant, do you truly see no issue with using THE terrorist act of this decade thus far, as fodder for an argument against the tiny, neophyte AMMA organisation -- or anyone, for that matter, not on the world stage? Really? The writer may say what he/she chooses, but should expect consequences for/reactions to those choices. If "Mastiff" is the name of our breed, then I see no argument with a group adopting a prefix. Karen, this world is going mad, with arguments and wars, to do with what someone has said or written !! I live my life, reading watching and listening to what is going on in the world, and i was affected badly, when i saw the twin towers crumbling down !!!!!! But i obviously do not read into statements written on a dog forum, the same as you do, because although you see it as a world platform, the amount of people that see these pages, are miniscule, and so why make mountains out of mole hills ? Grant, first, I DO NOT see the mastiff forum as an appropriate 'World Platform". That was a major part of my point! Further, I did NOT 'read into statements' -- there was a clear, unequivocal and unapologetic stated parallel on Steve's part that equated the justifications by the Muslim world (on the world stage) (which by the by, I am researching, and the support/blaming of the US for this act, on the part of the 'Muslim world' -- which is as diverse in thought as the 'Christian world' -- was by no means unanimous) with the alleged justifications and blame by the AMMA organisation. This, I repeat, is ludicrous. It IS a mole hill someone is trying to transform into a mountain. First, I am not 'them'. I am 'us'. The issue appears not to be the usurpation of the term Mastiff, but the nomenclature 'American Mastiff'. In fact, one of the reasons I personally believe our breed would be safer with the nomenclature "English Mastiff' is that if and when we begin having attacks on people/Gods forbid children ascribed to 'Mastiffs', we will have great difficulty in defending our particular breed. Do these look remotely like the same breeds? There is little chance of harmony, happening within any group of humans, after even a short time together !! I disagree with this, IF the group works to develop a common sense of purpose and reason for being, as well as values as to how they want to operate -- both with one another and with 'customers', the public etc. Again Karen, they are the ones making these claims! THE AMERICAN MASTIFF looks nearly identical to the English mastiff in color, shape, size, etc. however, they have a much dryer mouth due to outcross early on in the history of the breed. They are very much the "gentle giant." 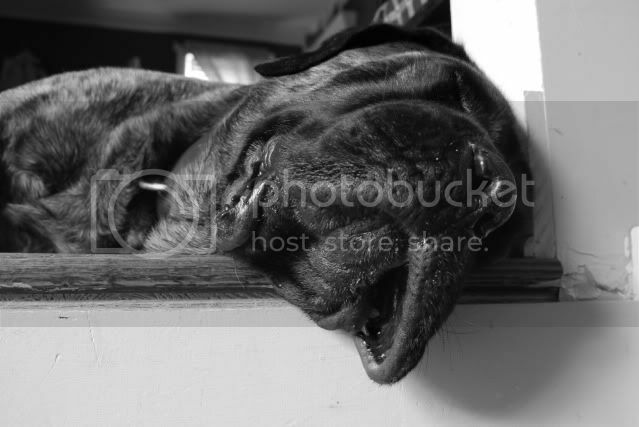 Temperament: The American mastiff is a combination of grandeur, good nature, and gentleness. Dignity rather than gaiety. It is no more than a money making scam riding the coat tails of the Mastiff proper. And as for reasoning with them, it is an impossibility, it has been tried and tried in the past and the result has been simply not responding to anything asked of them and what they are doing. Blocking people who ask too many legitimate questions from their pages etc. No comment, nothing, just an "ignore it and it will go away attitude" which is exactly what they want. I'm not going to go away until they provide proof of their claims. Please look at the pictures I provided. Do they LOOK like our Mastiffs? As I already said, they seem satisfied to be a small, niche pet market. They are NOT seeking AKA recognition -- please read my other posts on this topic. I say again, I am not 'them', I am 'us'. I do not speak for them -- just as a voice for reason. If you believe it is just a money making scam, so be it, although I hardly think a small, niche organisation with 11 breeders is going to rake in tons of money. More $$$$ for something so extremely rare! Frederika herself has produced well over 500 dogs. Do the math on that. ...and you are telling me this because? What reputable breeders do you know that produce that many dogs???? REPUTABLE. And you are asking me this because? Because the typical rate for this MIXED breed is $2,500 dollars. I counted her dogs on her website, go look yourself. Why would anyone WANT to produce that many?!?!? How do you find quality forever homes for that many and how the hell would you be able to even keep track of them to make sure that they are going to great homes??? Then there is the whole "We don't need rescue because our dogs don't end up in rescue", that IS A LIE! One breeder who has bred well over 500 dogs can account for each and every single one of them?????? They DO end up in rescue all the time, they end up in Mastiff rescue because in order for them to take the animal back it has to come with documentation proving that it came from them. I have rescued a shitload of dogs and NONE OF THEM have EVER come with documentation.